Wales have failed to have Russia thrown out of the Euro 2004 finals. Uefa has decided that Russia's Euro 2004 play-off win against Wales will stand despite Egor Titov's failed drug test. The Football Association of Wales believed the 1-0 second leg defeat to Russia should be void and instead declared a 3-0 win to Wales. They say Titov, who played 59 minutes of the second leg, was ineligible for that match. Wales drew 0-0 in the first leg of the play-off in Moscow only to lose in Cardiff four days later. But it was later revealed that Titov had tested positive for bromantan after the first game, in which he was an un-used substitute. Uefa's disciplinary committee read the FAW's written appeal on Tuesday, but decided the case to have the second leg result overturned was unfounded. "In reviewing the case the Uefa Control and Disciplinary Body made reference to the FAW's failure to provide evidence that the player was under the influence of a prohibited substance in the second-leg match," said Uefa in a statement. "In addition, and according to Uefa regulations in the case of a doping offence, the punishment anyway only applies to the player himself and not to the team. "This is further backed-up by the World Anti-Doping Code which states that in the event of one member testing positive for a prohibitive substance in team sports it is the individual and not the team that is liable." 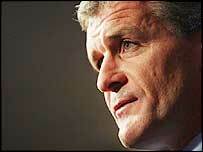 Wales manager Mark Hughes said they will decide in the next few days whether or not to appeal against Uefa's decision. "We'll have a look at what (Uefa has) actually said and the conclusions (Uefa has) come to, and we'll make a decision based on that," Hughes told BBC Sport. "We'll look to see if we can approach it in a different way." But Hughes firmly believes Uefa has missed an opportunity to send out a message that football takes a hard stance against drug cheats. "If one player is guilty, then the whole team should be guilty," Hughes added. Bromantan has been called the "secret" Russian drug and positive tests led to Russian athletes being stripped of their medals at the 1996 Olympic Games in Atlanta. They were re-instated because the then-unknown substance, a stimulant and masking agent, had not been on the International Olympic Committee's banned list. Titov was banned for a year and fined, along with his club Spartak Moscow, but the Football Union of Russia (FUR) escaped any punishment. Said FUR president Vyacheslav Koloskov: "I'm satisfied. "I was never seriously worried about possible sanctions against our team as I was sure that the Uefa disciplinary committee would never cancel our win." "We'll decide on Friday whether to appeal or not"